← Summer Books Week: Celebrating a Slatebreaking Year! Along for the Ride by Sarah Dessen. Penguin, 2009. Currently available. 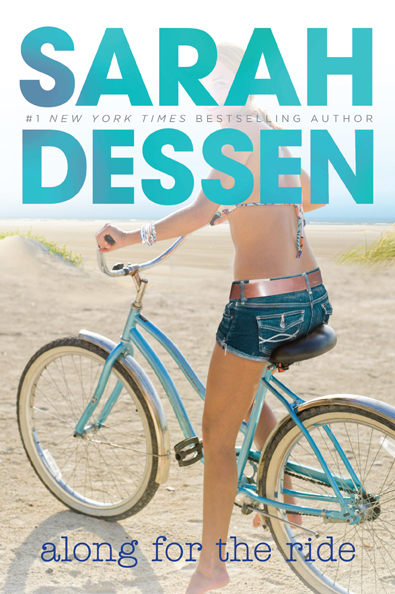 Face Value: Sarah Dessen’s books are notorious victims of terrible covers. The pink-tinged girly frivolity of the cover often betrays the depth of the writing inside. Along for the Ride had one of the worst covers: two disembodied teenagers perched on a bike. It encompasses all of the annoying YA cover trends. Given the disservice those covers do to Sarah Dessen’s books, I was thrilled when, at the beginning of the summer, Sarah and Penguin announced that all of her books would have new paperback covers. I saw this mass re-covering campaign as an opportunity to put covers on her books that would showcase the honesty and emotional intelligence with which Dessen writes. Most of the books had new covers that I found to be major improvements. Along for the Ride, however, was not so lucky. It is marginally better. But it doesn’t escape the disembodied teen trend. Although her head is there, the author’s name is printed in gigantic bold letters right over her face. And she’s wearing a skimpy bikini. In the book, Auden specifically comments on the skimpy bikinis sold at Clementine’s and how she wouldn’t feel comfortable wearing that sort of swimwear. This new cover was, in my opinion, the most disappointing of the bunch. I’ll hold out hope for something better the next time this cover gets updated (because I am confident that Sarah Dessen’s books will be popular with young readers for at least another decade). Does it break the slate? Yes – in an unexpected way. Auden starts her summer with rigid ideas about what it means to be a “smart girl” versus a “girly girl” and sees very little room for those identities to overlap. Her personal evolution is gradual and a bit reluctant, but she ultimately realizes that every girl and woman has the potential to craft an identity that spans social groups and fields of interest. Just because a woman enjoys fashion and socializing does not mean that she is incapable of intellectual strength. Auden experiences a personal liberation from stereotypes that empowered me as a reader. I am in a time of transition in my own life, and I was reminded that my professional pursuits could (and should!) co-exist with a healthy personal life. Who would we give it to? Young women who are in that final summer between high school and college. It is a liminal time – that limbo between who you were in high school and who you want to become in college. Auden makes the most of her transitional summer, and I can see how this would be the perfect book for that “in-between” time.Review: Sarah Dessen is one of the reigning Almighty Goddesses of YA. Her books appeal to young adult readers without pandering or dumbing down content. Although all of her books tend to have similar elements (shifting family structures, difficult parent-child relationships, and heroines who are suppressing emotion), each novel does something different with those ingredients. In Along for the Ride, Dessen introduces Auden, a young woman who is coping with the aftermath of her parents’ divorce. Auden has always been caught in the middle of her parents’ tumultuous relationship. When they were still together and fighting constantly, Auden developed persistent insomnia in the hopes that they would just stop fighting as long as she was awake. Now that they have divorced and moved on to other relationships, Auden still finds herself awkwardly trapped in complex parental give-and-take. Her mother has always been detached and career-focused, and pushes Auden to be the same way with her academics. Auden’s father, a novelist and professor of creative writing, struggles with his own creative process and tends to blame those around him when the words won’t flow. After the divorce, Auden stayed with her mother and watched her mom’s professorial career reach new heights. Her dad moved away, met and married a younger woman, and now has a new baby daughter. In the summer between her senior year and her freshman year of college, Auden has to make a choice: stay with her busy mother who is more focused on her grad students than she is on Auden, or go to her dad’s new seaside home in Colby and hang out there for a few months. To her mother’s dismay, Auden decides to go to Colby, hoping that the change of setting will somehow break through the numb routine that is her life. Auden doesn’t have high expectations for the summer. She regards her dad’s new wife, Heidi, as an over-enthusiastic girly girl with little to offer in the way of intellectual companionship. She doubts that any of the “townies” of Colby would be suitable summer friends – not that Auden is socially adept enough to make friends, anyway. Her plans include buckling down with her college textbooks so that she has a head start on her coursework in the fall. That’s right – Auden is a character so unable to separate herself from school that she thinks of preemptive studying as a pleasant way to spend her summer. In fiction as in real life, summer plans never quite turn out to be exactly what we thought they would. Auden’s baby sister Thisbe is a fussy baby who screams for hours each day, leaving everyone in the household frazzled and on edge. Heidi is overwhelmed with caring for the baby and Auden finds herself stepping into the role of household helper and frequent babysitter – something she never, ever thought she would be interested in doing. Meanwhile, Heidi’s business – the girly fashion boutique Clementine’s – is neglected. Auden offers to help Heidi out by doing the books for Clementine’s. She’s just bored enough that doing accounting work sounds good to her. Plus, the evenings at the store allow her to get away from the shrieking baby. Unfortunately for Auden, helping out at Clementine’s means that she has to come into contact with some of the townies that she has been avoiding. Clementine’s is staffed with young women of Colby who are the same age as Auden. Heidi thinks that this will be a great opportunity for Auden to meet people her own age. Auden thinks this is total crap. It’s never been easy for Auden to make friends, especially female friends, because she is so driven. She doesn’t understand why girls might be interested in boys, fashion, music, clubbing – none of that stuff has been a part of Auden’s life. It feels foreign to her, and thus she rejects it. Auden makes a bad impression on her Clementine’s coworkers. When she first meets Leah, Esther, and Maggie at the boutique, she thinks, “There is really nothing more intimidating than approaching a group of girls who have already made up their minds about you. It’s like walking a plank, no way to go but down.” It’s true that the girls of Clementine’s are not so eager to get to know Auden right away. But here’s the irony: Auden has already made up her mind about them. The girls who Auden perceives to be “plastics” – to borrow a term from the brilliant movie Mean Girls – are actually much more self-secure and well rounded than Auden. It is this misconception that Auden has to contend with throughout the summer as she learns to broaden her perception of other girls. This is my favorite sentence in the entire book. Some savvy graphic designer out there should turn this into a poster because I would totally buy it and hang it up in my office. Don’t worry, there’s also a romantic element to this story. It is a Sarah Dessen novel, after all. It is sweet and lovely and just the right kind of summer romance story. But for me, the romance was secondary to Auden’s self-discovery and broadening perspective on female roles. This book is Slatebreaking because it includes those tropes that we crave in a summer read: emotionally struggling girl meets mysterious emotionally struggling boy, they have adventures, physical chemistry happens. Yet Auden engages in these romantic moments not just because of lust, but also because of a growing awareness of herself as a multi-faceted woman. She can be an excellent student and a girl with a boyfriend and someone who likes to get dressed up every once in a while. A book can be a swoon-worthy summer romance and a thoughtful exploration of gender roles. Isn’t that fantastic? We readers searching for Slatebreaking summer books can have our cake and eat it, too. Reviewed from a library e-book. This entry was posted in Reviews, Theme Week, Young Adult and tagged Beach Reading, College, Divorce, Femininity, Romance, Sarah Dessen, Summer Books Week, Summer Reading. Bookmark the permalink.